Neil R. Fox, age 71, of Lewisburg, OH passed away Sunday, March 24, 2019 at the Greenbriar Nursing Center in Eaton. He was born October 11, 1947 in Dayton, OH to the late Roy L. and Margaret (Ross) Fox. Neil was a 1965 graduate of Twin Valley High School; was a U.S. Air Force Veteran who served during the Vietnam War being stationed at Bien Hoa, Vietnam; he retired in 2015 from Parker-Hannifin Corporation in Brookville after 39 years of employment; and he enjoyed motorcycles, visiting Lake Tahoe and was an avid Ohio State Buckeyes fan. In addition to his parents, he is also preceded in death by his sisters Carolyn Harvey and Judy Burcham; and brother Tom Fox. He is survived by his sister Connie (Everett) Blankenship; brother Jim (Judy) Fox; sister Donna (Jim) Edsall; sister Brenda (John) Fox; uncle and aunt Don and Iris Ross; and numerous nieces and nephews. 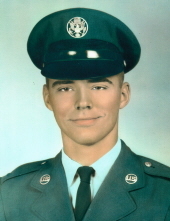 A graveside service will be held at 1:30 pm on Monday, April 1, 2019 at Sugar Grove Cemetery in West Alexandria, OH with full military honors provided by the Preble County Honor Guard and U.S. Air Force. Girton Schmidt & Boucher Gard Funeral Home in Eaton is assisting with arrangements. Memorials may be sent to Hospice of Dayton, 324 Wilmington Avenue, Dayton, OH 45420. Online condolences may be sent to the family by visiting www.gsbfuneralhome.com. To send flowers or a remembrance gift to the family of Neil R. Fox, please visit our Tribute Store. "Email Address" would like to share the life celebration of Neil R. Fox. Click on the "link" to go to share a favorite memory or leave a condolence message for the family.